At St. Anthony's Monastery, near Florence, Arizona, there is an icon, painted at Mt. Athos, called the Theotokos of Arizona. It is a beautiful icon, elaborately gilded with silver, of the Theotokos enthroned with Christ. I only have one problem with it, and that's that the artist very clearly has never been to Arizona. It doesn't radiate "Arizona." To me, as a native Arizonan, this is a problem. Meanwhile, last summer, severe wildfires burned parts of the Arizona countryside. This made me sad. 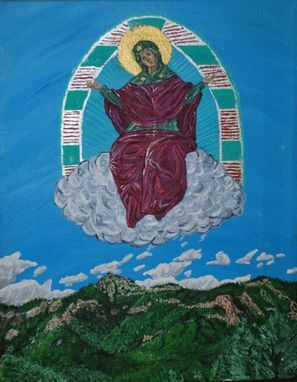 So, I decided to finally get started and work on this image, which is my take on the "Theotokos of Arizona." Her Halo is colored with turquoise, jasper, and silver; three major colors in Navajo Jewelry, and she is hovering over the Mogellon Rim; one of the major landscape features that make Arizona unique, an area which about 20 years ago was burned to the ground in one of the most severe forest fires the state has ever seen. The cloud is darker than in most icons like this, representing the life-giving stormclouds of the summer monsoon.